I tried googling ‘Staffordshireware Highlander’ to see if I could find out a bit more about my Highlander but, frustratingly, all I got were pictures of Japanese Staffordshireware Highlander cars! I’ve no idea why they would name a car after a piece of 19th century popular pottery? And the deer might not be a deer; but it has hooves so it’s certainly not a dog. 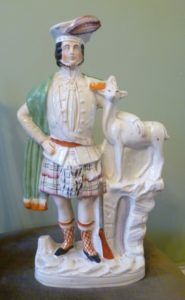 What the Staffordshire figure does show, however, is the popularity of all things Scottish in the 19th century. This came into being thanks in no small part to the poet and novelist Sir Walter Scott (1771-1832.) Scott was born in Edinburgh and went to school and university there. As a child, he fell in love with the old Border ballads, those stirring and often tragic tales of Scottish history with thrilling imagery, like these lines from ‘The Ballad of Sir Patrick Spens’: ‘They hadnae sailt a league a league/ A league but barely three/ The lift grew dark and the wind blew loud/ And gurly grew the sea.’ As a child, I loved the ‘gurly’ sea. I’m not sure what it means but it certainly sounds menacing. Scott started writing his own stirring poetry, like Lochinvar, and The Lay of the Last Minstrel. 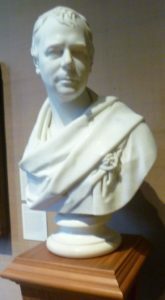 Scott went on to write historical novels, the most famous of which is possibly Waverley, usually set in Scotland’s past – and in so doing, invented the Historical novel. In his skilled hands, Scotland’s history was thrillingly retold. 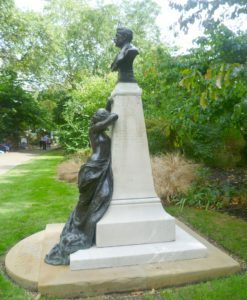 Memorial bust in Victoria Embankment Gardens, London, of Sir Arthur Sullivan (1842-1900) whose opera ‘Ivanhoe’(1891) was based on Sir Walter Scott’s novel of that name. You cannot miss the weeping female clinging to the plinth. Scott’s novels are little read today: too long, too wordy and too much description, perhaps, but their thrilling plots have been a boon to dozens of opera composers. To take just a few; Donizetti’s Lucia di Lammermoor, from Scott’s The Bride of Lammermoor; Bizet’s opera based on Scott’s The Fair Maid of Perth; and Arthur Sullivan, composer of H. M. S. Pinafore, wrote his only ‘grand opera ’Ivanhoe’ in 1891, based on Scott’s Ivanhoe. I have always had a soft spot for Sir Walter because he was a staunch admirer of Jane Austen’s novels. And those of you who are railway buffs will recognize the GWR Waverley Class steam locomotives named after Scott’s novels: The Talisman, Redgauntlet, and Kenilworth, etc. I come from a railway family myself so I say this with pride. And, of course, Edinburgh’s Waverley Station is also named after Scott’s book of that name. Suddenly, in the 19th century, things Scottish were everywhere and one might argue that it was Scott who helped the Scots to re-establish their national identity after the trauma of the Jacobite Rebellion. After Scott’s championship of all things Scottish, the Prince Regent, now the newly-crowned King George IV, and a fan of ‘the wizard of the north’s’ historical novels, visited Edinburgh in 1822 and Edinburgh went wild. 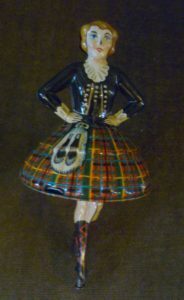 The wearing of the kilt and other traditional items of Highland dress had been prohibited after the crushing of the Jacobite Rebellion in 1746. The ban was repealed in 1782 but interest in reinstating traditional dress was lacking. Now, suddenly, the kilt was back in fashion and the King let it be known that the wearing of traditional Highland dress was expected during his visit. Originally, tartan designs were attached loosely to regions and districts rather than being specific to individual clans but, in 1822, all that changed. Edinburgh tailors frantically rushed to invent new tartans for the various clans. 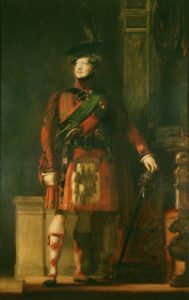 George loved clothes and dressing up and he took full advantage of what the kilt and all the accoutrements of sword, sporran, pistol, and red and white diamond-patterned stockings could do to enhance a man’s figure. George was a not-so-closet Jacobite; he admired King Charles I’s undoubted artistic taste and began to collect Jacobite relics. He was in touch with Henry, Cardinal York (1725-1807), Bonnie Prince Charlie’s younger brother, and the last of the royal Stuart line. Cardinal York bequeathed him a diamond ring worn by King Charles I which had once been part of the royal regalia of Scotland. King George IV’s attachment to the Stuarts was more romantic than political, but he did a number of practical things to restore Scottish privileges. He encouraged the use of traditional Highland dress; and he restored Jacobite peerages which had been proscribed after the ’45 rebellion. Queen Victoria and Prince Albert also picked up the Scottish baton. Queen Victoria fell in love with Scotland; it was somewhere she could be herself and not be always on show, She loved the scenery, the people and the freedom it gave her. She bought the Balmoral Estate in Aberdeenshire in 1852, and she and Albert built themselves a new castle there in 1856. She loved exploring her new estate, and it wasn’t just sedate carriage outings; we know that she was an excellent walker over rough ground. For Prince Albert, Balmoral reminded him of his childhood home of Rosenau Castle in Germany. All the royal princes wore the kilt when in Scotland and were encouraged to walk, ride, fish and shoot. And, of course, as today, one could buy tins of food items of Scottish provenance with Highland scenes on the tin. And it was easy to tell it was something Scottish you were buying because the pictures depicted shaggy Highland cattle with their handle bar horns; castles; heather-covered mountains, and stags at bay looking very like Sir Edwin Landseer’s The Monarch of the Glen from 1851. Landseer had visited Sir Walter Scott at his home in Abbotsford and drawn the author and his dogs. He was knighted in 1850 and was often a guest at Balmoral. As I’ve been writing this post, I’ve been struck by how the different strands have inter-connected. Sir Walter Scott’s influence is everywhere; he’s one of those people that everyone knew about in the 19th century. He knew the brilliant but dissipated poet, Robert Burns; the artist Sir Edwin Landseer, and it was Scott who stage-managed and organized King George’s visit to Edinburgh in 1822. And Albert, the Prince Consort, invited Landseer to Balmoral. Photos: The portrait of King George IV by Sir David Wilkie, 1822, in the Palace of Holyroodhouse, courtesy of the Royal Collection Trust / © Her Majesty Queen Elizabeth II, 2018. 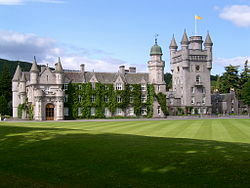 The photo of Balmoral Castle is from the Balmoral Castle website. All the other photos by Elizabeth Hawksley. Fascinating. Not surprised at anything highlander to be honest. The romantic myth persists, probably due to Scott’s Rob Roy. I believe that is one of his novels. Prolific author. Lucia do Lamermoor is a wonderful opera, isn’t it. I hadn’t realised quite how big Scott’s influence was on the popularity of Scotland. Thank you for your comment, Elizabeth. Actually, it’s perfectly possible that my Highlander is a character in one of Scott’s Scottish novels -and he wrote many with a Scottish background. It could even be Rob Roy himself. Quite often, Staffordshire figures have the subject’s name along the bottom, but this piece, alas, does not. So either it is a generic Romantic Highlander, or else the character was so well known at the time that the designer just assumed that everyone would know. Somewhere I have a book of Scottish tartans, I must see if I can find it and check out the Highlander’s tartan. What a great post! My parents had a Staffordshire Scotsman and a Scotswoman at either end of the fireplace; as they’d been there forever I never took any notice of them. When I was seventeen I raced through Rob Roy, Ivanhoe, and a couple of other Walter Scott’s novel. I’m sorry to say that the only thing I remember is a thrilling swordfight on a castle staircase – all very Errol Flynn. Perhaps one day I’ll muster the willpower to give Scott another go. Gosh, Prem! Respect! I, too, read a number of Scott’s novels as a teenager but my racing through included with leaps over pages where nothing much seemed to be happening or where I couldn’t cope with the Scottish dialect. I wish I remembered the thrilling sword fight – perhaps I should give them another go. Actually, I’ve occasionally wondered if they’d be more popular nowadays if they had some serious editing to prune bits which go on rather too long for today’s readers. Jumping in here. I read Ivanhoe many moons ago, and did check out Lucia di Lammermoor but found it hard going. Having just ploughed through Dickens’ Dombey and Son and really had to force myself to keep going through to the interminable end, I am in no mood to try Scott at the moment. But I may keep him on the back burner! If you haven’t read Dombey and Son, really don’t bother. It is quite the worst Dickens I have read. It’s got some marvellous passages, but the structure is terrible. It never seems to going anywhere, it’s bitty, meanders in the most annoying fashion and he clearly didn’t know which of his many main characters was actually the main protagonist. Still, it’s comforting to know that even the greats wrote the odd dud! Poor Elizabeth! I’m really sorry you didn’t like Dombey & Son. I have read it a number of times. Remember, it was published in 20 monthly parts which, technically, is quite a challenge; and he was writing only two months ahead of the next instalment. I agree that Florence is rather sentimentalised, and saintly little Paul Dombey is a bit of a pain, but I like the nautical instrument-maker, Sol Gill; and Captain Cuttle; the spiky Susan Nipper; and Edith Dombey, Florence’s stepmother, is an interesting character. It also features the first death by railway train in fiction! Perhaps it’s a bit Curate’s egg-y – good in parts. Re-reading your criticism – I think, actually, we are both in agreement but I am being more forgiving! I think the instalment issue was pretty obvious in this book, which it isn’t in others. Yes, agree about the characters. Actually found a lot of it over-sentimental and got tired of Edith and/or Dombey addressing each other in long and terribly involved periods which were not very easy to follow – especially when I was growing impatient to get to the end of them! All power to your elbow reading it more than once! I doubt I shall ever tackle it again. I’m going to read another of the more obscure ones that I’ve not read before, but I’m having a break first.